Dental health is an area that’s often neglected. Nearly 50% of Australian children by the age of 12 are affected by tooth decay, and 3 million hours of paid work or study are lost by Australian adults due to dental issues. Dental check ups should be scheduled every six months to preserve your dental health. Tooth loss is largely preventable with the appropriate care. At Vital Dental Care, we aim to make your first visit to our practice a pleasant experience for you and your family. Our friendly staff members will welcome you, and upon arrival, make yourself comfortable in our waiting area. 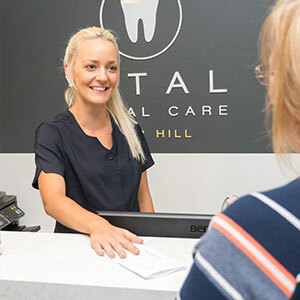 You’ll find that our modern facility is designed with state-of-the-art care in mind and you will be able to enjoy music, TV and Netflix during your dental treatments and to help you relax. We suggest new patients arrive a few minutes prior to their appointment time to complete relevant paperwork. We ask that you reserve approximately one hour of your time for your new patient appointment. This will involve a consultation, where Dr Chou will take a detailed medical and dental history. Dr Chou will listen to your treatment concerns and provide you with a range of options to suit you and your lifestyle best. Your preliminary check up will include a general dental health check, and he may suggest that radiographs and pictures be taken to assess areas that aren’t visible during your clinical exam. Your treatment will conclude with a teeth cleaning, polish and fluoride treatment which will help you to maintain your healthy smile. Not sure which health fund to join? Then compare policies via privatehealth.gov.au: a non-biased comparison website by the Australia government. Please be sure to let us know if there is anything we can do to make your experience more comfortable. Dr Chou has a high level of empathy for his patients, as he also used to dislike trips to the dentist growing up. He will make every effort possible to ensure your visit with us is a pleasant one. Dr Chou will prepare a detailed treatment plan where required, which will outline all costs involved and number of appointments required. If any treatment is recommended, Dr Chou will present his recommendations as well as any alternatives that may be available. Your care will be tailored to both your oral health as well as your long-term vision and goals. Vital Dental Care is a HCF Preferred Provider but we also accept all insurance plans (including Veterans’ Affairs) and file claims on the spot through HICAPS. Book your appointment online now or call our Camp Hill dentist to schedule. We are a HCF Dental Preferred Provider! Vital Dental Care is a dental preferred provider for HCF! This means that HCF members will be able to claim their no-gap services, one or two fully covered check ups per calendar year (depending on your level of cover). Give us a call for more information so that you don’t miss out of the benefits!